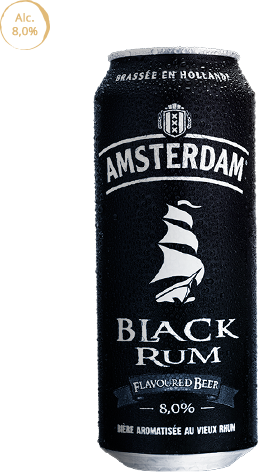 Amsterdam Black Rum is a beer with the flavour of aged rum. A delicate balance between malt, hops and aged rum create a beer with an intense and assertive flavour. It has an ABV of 8.0%. The newest addition to the range; this is the most audacious of Amsterdam's beers, responding to a demand for diversity from lovers of characterful beers. In appearance, it is blond with an amber sheen and a dense, ivory-coloured head. Intense, with a pronounced and enticing fragrance of rum. Beneath the dominating rum scent, subtler woody notes can be detected. A rich blend which exudes pleasant aromas. The apricot and nut aromas are lifted by the spices of the aged rum which give Black Rum a full-bodied intensity. Slightly bitter on the palette, it unleashes an explosion of sensations, full of noble and flavourful notes.